The Academy Levels are a series of five auditor classification courses where the principles of Scientology and what it achieves become manifest. Each Academy Level is an intensive two-week course which runs on a schedule of forty hours of course time per week. Students study either on a day schedule of eight hours of course periods five days a week, or on an evening and weekend schedule of three hours per evening and eight hours per day on the weekends. Each course consists of theory study and practical application of a specific aspect of Scientology technology. Each Academy Level corresponds to one of the Scientology Expanded Grades discussed in the last chapter and teaches the underlying principles of that Grade, as well as the auditing techniques. Because each level deals with a specific aspect of life and the way to improve that aspect, by acquiring the data from these levels one becomes more causative overall. In short, the Academy Levels contain answers to the barriers that hold people back from success in their lives. On Level 0, a person learns the basic actions of auditing, such as proper auditing session form and how to operate an E-Meter. He learns techniques which address communication and how to free another’s abilities in this area. This level teaches a person the anatomy of problems-why people get problems in the first place and the mechanics of eliminating problems. 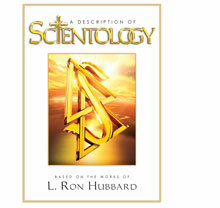 The student reads two more basic L. Ron Hubbard books, hears eleven lectures on problems and their successful resolution through auditing and learns the auditing skills and processes of Expanded Grade I. Here, a person learns about the ramifications of harmful acts and how these affect survival. This course contains the technology of bringing relief from such hostilities and returning trust and honesty to life. The student studies another book, hears fourteen lectures, then learns further techniques and the processes of Expanded Grade II. Level III covers the technology to free anyone from past upsets. One learns the mechanisms behind personal upheavals and how to alleviate the harmful after-effects. The student learns more advanced E-Meter drills and more skilled auditing techniques which are used in the processes of Expanded Grade III. Another book of Mr. Hubbard’s and seven more lectures are part of the materials studied on this course. The final Academy Level teaches the student how to handle fixed conditions in life. The technology of Level IV gives one the ability to change, to accept new ideas and to achieve his goals. Two more books are studied, seven lectures are heard and the Expanded Grade IV processes are taught. The Academy Levels 0-IV constitute the basic Scientology auditor training. The student not only learns to help preclears in auditing, but also how to better handle his own life and help others deal with theirs. The next training step upon completing Class IV Auditor training is the Hubbard New Era Dianetics Auditor Course which contains a summary and refinement of Dianetics, based on the decades of experience gained in the subject after its release. New Era Dianetics does not change any of the theories or principles of Dianetics as Mr. Hubbard originally developed them, but later breakthroughs resulted in this ultimate Dianetics technology, New Era Dianetics. All Dianetics technology is included on this course including three basic books and five lectures on Dianetics and its use. With the procedures and techniques of NED auditing, an auditor can obtain results many times faster than earlier technology. The student learns auditing procedures that effectively address any psychosomatic complaint a preclear may have. Over ten specific NED rundowns allow the auditor and preclear to erase engrams and often bring him to the state of Clear. Clearing is within reach of millions and New Era Dianetics technology delivered well by NED Auditors is the primary means by which this will occur.